Welcome to the most unusual seating arrangement at this year's GIAF. WHEN YOU walk into the Black Box to see a theatre show, what do you expect to find? A mixture of tiered seating and ground level seating facing the stage. However a show at this year's arts festival, will do away with all that. 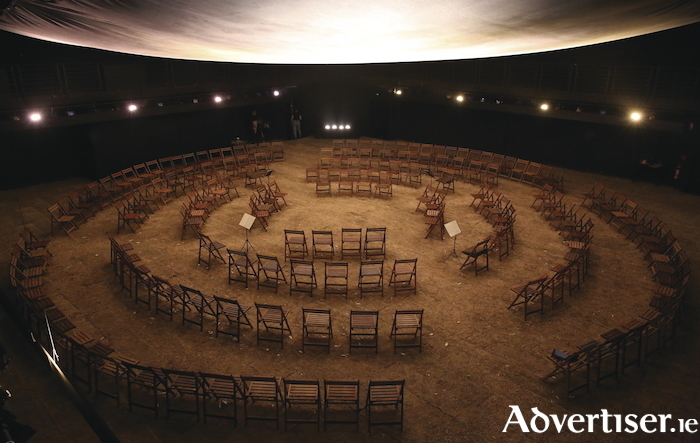 When people enter the Black Box to see The Aspirations Of Daise Morrow, they will find themselves walking onto a vast mound of clay spread out across the venue floor; on top of that mound will be a series of chairs arranged in near continuous circles. The audience will be seated and await the start of the show, but instead of watching the action unfold on a stage, the audience will be on stage themselves, with the actors - and also musicians - walking between the rows of chairs, passing in front of, behind, and around the audience, as they perform. For this alone, The Aspirations Of Daise Morrow is set to be among the most intriguing and talked about shows of this year's GIAF, during its July 23 to 28 run. The play itself, directed by Chris Drummond, is an adaptation of the novel Down At The Dump by the Nobel Prize winning Australian author Patrick White. The Whalley family are getting ready for a day at the dump, while next door, the Hogbens prepare to bury the outrageous Daise Morrow, a free spirit whose youthful romantic exploits scandalised the staid residents of her tiny town. The Aspirations Of Daise Morrow has been called a "visually captivating, splendidly lucid stage adaptation" by The Australian. It features music performed by the Zephyr Quartet. For tickets see www.giaf.ie, 091 - 566577, or the festival box office, Galway Tourist Office, Forster Street. Page generated in 0.0590 seconds.